It’s great when the club ride schedules its cake stop in a place of interest. Outside the small village of Old Warden in Bedfordshire, you’ll find the Shuttleworth Collection, a museum housing early vintage aircraft, cars, motorcycles, penny farthings, and a motley selection of farm vehicles. Next door to it is the Swiss Garden, a Regency garden landscaped in Capability Brown-fashion to resemble the Swiss landscape. Quite remarkable, really. But to slake the thirst and replenish the carbs for a group of hungry cyclists, between the two there is an extensive café and restaurant, built to cope with large numbers. At this very ‘unbusy’ time of the year for cafés, a couple of groups of wheelers bring along some tidy business. But this fine, frosty Tuesday morning, as I approached Cambourne and could almost smell the coffee beans roasting, a loud gunshot sounded….right next to me (or so it seemed)….so frightening, that my ‘knee-jerk reaction’ was to duck down, avoiding I-know-not-what, nor from which direction. My heart missed a couple of beats, and I looked around for the culprit…….then, oh yes, the realisation dawned on me………I felt the rough surface of the road beneath my saddle……. 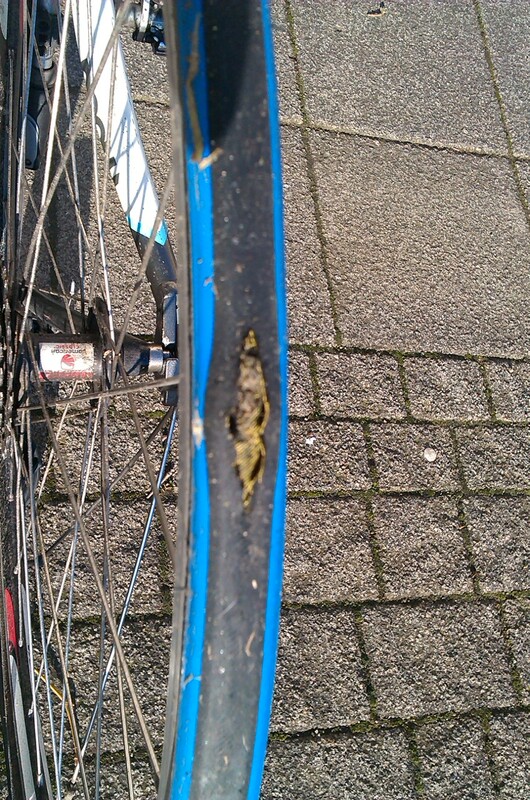 A ‘blowout’ so violent and sudden that the tyre had deflated instantly, had blown a huge hole in the outer casing, and it only took me a few seconds to decide to abandon all thoughts of repair, and to start walking the two miles to Cambourne in the hope of finding a bike shop. Alas, the only bike shop in this concept settlement (Cambourne is entirely the product of town planners’ imaginations) had closed a few months ago, but my disappointment was assuaged both by the tea, cakes and company in the café, and my wife’s willingness to drive out and pick me up. Where would we guys be without our spouses? Some people ride bikes for exercise, pleasure, as a challenge, to beat their personal best…………others simply to justify the luxury coffee and large slab of cake they consume at the cafe stop. In fact, cafe stops are such an integral part of a cycling club’s routine ride that a perfect collective noun for cyclists could be a ‘cafe’ of cyclists……. Now, roadies are usually a civilized bunch of people, but we do take up space, and some machines (trikes and recumbents) can’t be parked nice and neatly against a wall: The Olive Branch Cafe in Brixworth is owned by the Christian Fellowship, a charity that supports projects in the community, especially senior citizens. They always make this crowd of wheelers feel welcome, and their prices are the cheapest anywhere in these parts. And venues like this make me put in the miles. There are days when I head out to do a round trip of 70-80 miles,……..just to have tea and cakes……..and enjoy the company of fellow roadies, of course. It’s worth it.